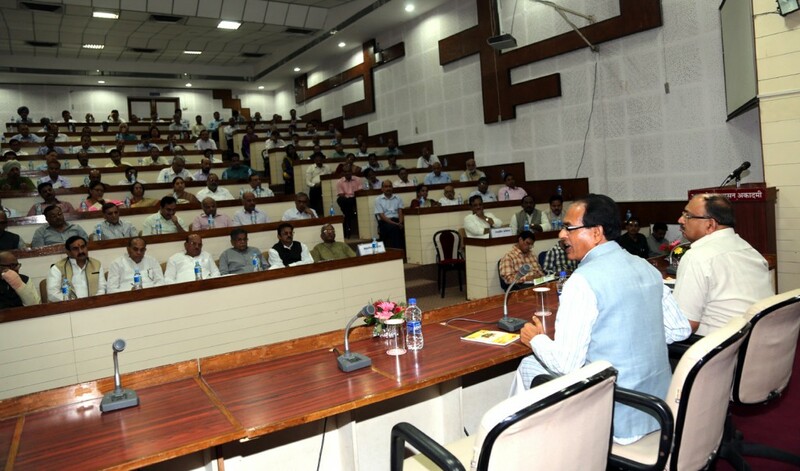 Bhopal, October 31, 2015 (Ataullah Faizan): Chief Minister Mr. Shivraj Singh Chouhan has said that Madhya Pradesh will show the way to make agriculture profitable. It would give a new direction to agriculture in India. Along with their duties, officers of all 3 All-India Services should keep connected with campaign to improve agriculture. The Chief Minister inaugurated group discussions of officers of All-India Services at Academy of Administration here today. These officers have visited villages for 3 days to assess situation of farming and farmers in the state. The Chief Minister said that after visits to villages, the officers have pointed out practical difficulties and suggested solutions. The officers should use their talents in suggesting ways to change condition of farmers and farming. He said that farmers’ condition worsens when crops suffer loss. But it should be pondered as to why farmers get very low profits when crops are good. Cost of farm inputs is increasing continuously and income of farmers decreasing. There are no arrangements to guide farmers regarding use of seeds, fertilizers and pesticides. Farmer is at a loss to understand as to what quantity of which fertilizer or pesticide should be used at what time. Arrangements for agriculture extension and guidance should be ensured at field level. Students and scientists of Agriculture Universities should be connected to farmers. It should also be pondered as to how crop insurance can be made useful and effective for farmers since farmers do not know how much insurance premium has been taken from them for which crop. Mr. Chouhan said that despite availability of adequate power, problems are cropping up in its supply. The problems include delay in replacement of burnt transformers, erroneous bills and duration of temporary connections being only 4 months. These arrangements should be improved. He said that the farmers who had sown mixed crops have suffered less loss than those who sowed single crop. Farmers do not get fair price of crops due to middlemen. For this, arrangements at Mandis should be improved. Arrangements of fertilizers and seeds should be made at places where it has rained recently and crops can be sown. Large number of ponds and structures for conservation of river water should be constructed to increase ground water level. He said that all officers have informed after visiting villages about systematic public distribution system in villages and that the poor are getting subsidized ration through them timely. Process of payment of assistance, labour charges, wages and subsidy under various schemes to the poor should be pondered. Complaints regarding delay in this process have been received. Arrangements should be made to convey results of soil testing at the earliest. It should also be contemplated as to how marginal farmers succeed and have alternative sources of employment. Employment-oriented schemes should be monitored regularly.